Armadillos frequently make dens in sheds, under porches, and in crawl spaces. It is important to remove them because they can carry salmonella, tapeworms, and rabies. They also do much damage to yards and gardens because they dig, making armadillo burrows. They have a piggish snout, strong legs and sharp claws which combined together make an excellent digger. Our professional wildlife control technicians use several kinds of armadillo traps, depending on the type of infestation and the laws of the area. Our operators have the best solutions for your problem and will customize their efforts to the characteristics of your specific property and the animal problem at hand. Read more about armadillo control, trapping armadillos, and how to get rid of armadillos and remember to check out our Armadillo Photos and prices for armadillo removal. Bats roost in attics, chimneys, and eaves. They live in colonies which can be very numerous or relatively small in number. Bat droppings are powdery which allow the bacteria inside to become airborne, making infestations very unhealthy for humans. Bat bites can also pose significant health risks. Bat extermination is not advisable since they are a federally protected animal; however, our technicians are able to get rid of bats through a special technique called venting. Venting allows the bats to exit a building unharmed, but does not allow them to return. After our wildlife control operators vent a building, they seal up all the little cracks and holes so bats cannot return. This step is very important and cannot be skipped, or the problem will recur. Read more about bat control in attics and bat removal and remember to check out our Bat Photos and prices for bat removal. Beavers can make a real mess out of pools, ponds, rivers and trees. Beaver damage is a common problem for properties along waterways, because beavers not only can alter the flow of the water, they also destroy many types of vegetation. Getting rid of beavers can be difficult; our experienced technicians have many styles of beaver traps for this purpose, and each one has different uses. Generally, it is the location of the beavers that determines which kind of trap we employ. Read more about beaver control and trapping beavers and remember to check out our Beaver Photos and prices for beaver removal. Chipmunks are burrowers. They sometimes dig under stairs, patios, and walls which can cause settling and damage. They are annoying because they destroy gardens by eating flower bulbs, fruits, vegetables, and seeds. Our wildlife control operators know how to get rid of chipmunks, whether the critters are under your porch, in your garden, or in your trees. 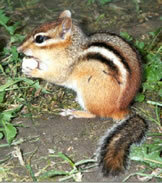 Usually, our technicians utilize a chipmunk trap for this purpose; then they remove the animals from your property. Read more about chipmunk control and chipmunk extermination and remember to check out our Chipmunk Photos and prices for chipmunk removal. Feral Cats are house cats living in the wild. They tend to live near humans, making their homes in barns, junk cars, weeds, etc. Feral cats scavenge whatever food they can, and prey on songbird populations, pond fish, pet food, garbage, and small rodents. They are also known to destroy game bird populations, such as pheasants. They occasionally attack domestic poultry and household pets. Some areas of the country have tried to control feral cats by spaying and neutering them, but the cats still terrorize and kill local wild birds. It is usually wise to just get rid of feral cats altogether. Our wild animal removal specialists have highly effective feral cat traps that can take care of this problem safely and humanely. 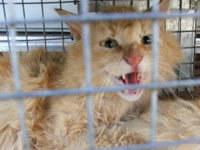 Read more about catching feral cats and remember to check out our Feral Cat Photos and prices for feral cat removal. Gophers Terrible damage is done to lawns, fields and golf courses by gophers. Their underground tunnels can be very extensive, and they leave dirt mounds everywhere they dig. Since they live underground, it can be very frustrating to know where to begin getting rid of gophers. Our wildlife control operators utilize special gopher traps which are an effective means of gopher control. Our specialists can also help property owners determine ways to make their property less attractive to gophers. Read more about gopher extermination and remember to check out our Gopher Photos and prices for gopher removal. Mice can live just about anywhere, but we see them most often in attics, sheds, barns, under porches, in crawlspaces, inside walls, inside parked vehicles, and in unused machinery. Their nests are messy and they may rip up other areas of your house looking for nesting material. Mice are prolific and infestation must be addressed or the population will grow unchecked. Mouse droppings are not the only sanitation problem associated with mice; they also bring pest insects with them wherever they go. Our wildlife removal experts have several varieties of mouse traps which are very effective means for getting rid of mice. Read more about mouse control, mice extermination and mouse poison and remember to check out our Mouse Photos and prices for mouse removal. Moles cause terrible damage to lawns, fields and golf courses. They are persistent diggers and leave mounds of dirt everywhere they dig. It can be extremely frustrating to try to get rid of moles because since they are underground, you can never see where they are. Our experienced animal control technicians have mole traps and techniques that are very effective. We also offer mole repellent, which has somewhat less success. Our technicians can further assist property owners by determining ways to make their properties less attractive to moles. Read more about mole control and mole extermination, and remember to check out our Mole Photos and prices for mole removal. Opossums are attracted to shelters such as attics, chimneys, sheds and barns. They are not vicious animals, but are a problem to the nose because of their smelly opossum feces. They also bring pest insects with them on their bodies, which will take up residence wherever the opossums go. Our wildlife control operators offer professional opossum pest control, and have specialized opossum traps for that purpose. Read more about opossum removal and opossum control, and remember to check out our Opossum Photos and prices for opossum removal. Porcupines have ever-growing teeth and so they chew and gnaw all day long. They do a great deal of damage to trees, orchards, ornamental plants, and other vegetation and property. Their chewing exposes the damaged plant or tree to diseases and also weakens its structure. Our pest animal control technicians have a variety of porcupine traps in several styles that enable them to catch porcupines no matter what their location. Read more about porcupine control and trapping porcupines, and remember to check out our Porcupine Photos and prices for porcupine removal. Rabbits eat and trample gardens, yards, and fields of crops. They have large appetites and can graze and nibble away plants down to nothing very quickly. They multiple swiftly and it does not take long for a small population to become a large one with numerous baby rabbits. 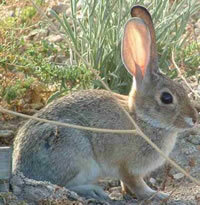 They also dig, which is dangerous because people can easily twist an ankle in a rabbit burrow (rabbit hole). Our wildlife removal experts know how to get rid of rabbits and have several styles of rabbit traps that are very effectual. Read more about rabbit control, catching rabbits and rabbit bait, and remember to check out our Rabbit Photos and prices for rabbit removal. Raccoons grow quite large, but are able to enter homes through small openings. Mama raccoons regularly make dens for their baby raccoons in people’s homes; raccoons in attics and chimneys are one of the most frequent of all animal complaints that we hear. These large rodents generally cause a lot of destruction to both homes and exterior property. They will rip out electrical wires and insulation and they create a lot of urine and waste products, which can seep through walls and ceilings. They are strong and nimble, and can rip up shingles and siding. Being excellent climbers, these critters like to run and play on rooftops and can be very noisy. Raccoons usually live in groups, so if you see one on your property there are most likely more nearby. 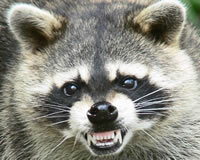 Raccoons will destroy gardens and steal fruit crops. They have a way of knowing exactly when the corn or peaches ripen and harvest them in the night, sometimes taking the entire yield. Our wild animal control technicians have raccoon traps and products specially designed to get rid of raccoons, and techniques to persuade a mother raccoon to relocate herself and her babies naturally. Read more about raccoon control and remember to check out our Raccoon Photos and prices for raccoon removal. Rats are opportunists and will seize any location that offers food, water and shelter. They like attics, walls, crawlspaces, sheds, barns, and garages, but can adapt to just about anywhere. They are notorious disease carriers. These fast-moving rodents are quite sneaky and leave rat droppings everywhere; they are generally very messy. Rats will rip apart insulation and chew through wiring, creating a serious fire hazard. It is important to get rid of rats as soon as you realize there is a problem. Our animal control technicians offer highly effective rat poisons and rat traps, and also perform cleanup and repair services. 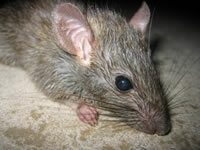 Read more about rat infestations and rat control, and remember to check out our Rat Photos and prices for rat removal. Rodents Mice, rats, raccoons, squirrels, chipmunks, beavers, porcupines and gophers are all members of the rodent family. Rodents generally scratch, scurry, and many of them dig. They have sharp teeth that keep on growing, so they chew and gnaw on things almost constantly. Any rodent that has taken up residence in your home or on your property can become a terrible nuisance because of the smells, urine and droppings, and noise (fighting, squeaking, growling, running, etc.). Rodent damage from gnawing and urinating/defecating can be extensive, both inside and outside a house or a business. Rodents carry diseases, many of which are communicable to humans quite serious. Certain animal diseases are only transferred to humans through bite; others can be communicated by handling animal droppings or breathing airborne particles from feces. Our professional wildlife removal operators can trap rodents and remove them from your property, then clean up all the mess and decontaminate and deodorize the affected areas. We also offer rodent repellents which are effective for certain animals such as raccoons, skunks, and moles. Read more about rodent control and rodent trapping, and don’t forget to check out our Rodent Photos and prices for rodent removal. Skunks are beautiful-looking creatures, yet possess in their glands a highly irritating natural substance. 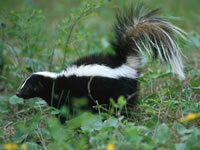 Skunk smell is immediately recognizable, and skunk odor can travel for miles. It is extremely difficult to remove from carpets, upholstery, and pets. If skunk spray gets in the eyes, it causes temporary blindness and searing pain. Skunks frequently take up residence under porches and in sheds, crawlspaces and woodpiles. Occasionally they wander inside homes through pet doors. Our wildlife control operators know how to get rid of skunk smell and how to remove the animal, too. Read more about skunk control and remember to check out our Skunk Photos and prices for skunk removal. Squirrels nest in attics and chimneys, but they can make do with wall cavities, crawl spaces, or even dryer vents. Squirrels in an attic will chew through electrical wiring and rip up and contaminate insulation. They carry insect pests on their bodies and frequently bring disease and bacteria with them. These rodents are very destructive, very messy, and where one leads more will follow. It is important to get rid of squirrels as soon as you suspect there is a problem. Our wild animal removal specialists have squirrel traps and techniques that are highly effective. 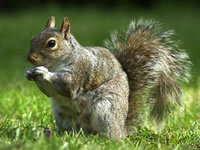 Our technicians also offer cleanup services for squirrel droppings and decontamination of affected areas. Read more about squirrel control, and remember to check out our Squirrel Photos and prices for squirrel removal. Voles live in groups or colonies, sometimes numbering in the hundreds. They destroy root systems, lawns, and many varieties of vegetation. A vole infestation will create trails across lawns and golf courses, leaving so many lines that what was once beautiful landscaping or grass now looks like a roadmap. Another way to describe the shape of vole paths is that they look like the shape of a tree with many branches pressed two-dimensionally into the lawn. Our wildlife control operators have a specialty vole poison designed specifically to get rid of voles. 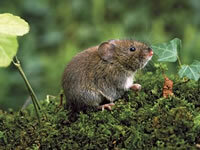 Read more about vole problems and vole control, and remember to check out our Vole Photos and prices for vole removal. Pigeons are among the messiest of pests. 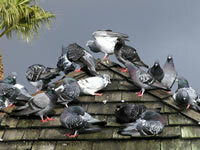 They congregate on roofs of schools, churches and industrial buildings, sometimes in very large numbers. They are also frequently seen in parks, on statues and sidewalks, leaving their droppings everywhere. They do not scare away. Pigeons are unsanitary and bring a host of insects with them on their bodies; some of their diseases are transferrable to humans. This is particularly problematic if their rooftop activities occur near ventilation ducts. Our pest bird removal specialists can get rid of pigeons safely. Our technicians provide effective, long-term solutions to pigeon problems. Read more about trapping pigeons and pigeon control, and remember to check out our Pigeon Photos and prices for pigeon removal. Swallows, or Mud Swallows are migratory birds and as such are federally protected. We are limited in some ways as to what we can do to control them, but we have swallow repellent products that are very effective. 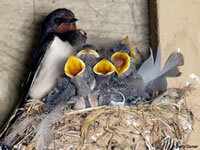 Swallows build mud nests on siding, brick or stucco, and bring a host of insect pests with them. Sometimes the insect problems that they bring are worse than the swallows themselves. They are dirty birds and leave droppings everywhere they nest, and their numbers can grow quite large. Swallows will return to s nesting site year after year, multiplying in numbers each time and causing contamination and staining of property. By federal law, if baby swallows are present we have to wait for them to fly before we can remove swallow nests. If you have a swallow problem, it is wise to take action quickly. Our pest bird control technicians have products such as slip brackets which deter swallows but do not harm them and thus comply with the law. Swallows can be very frustrating, but our experienced wildlife removal operators can assist you with an effective and legal solution. Read more about how to get rid of swallows, and remember to check out our Swallow Photos and prices for swallow control. Woodpeckers, or Flickers can be very aggravating, especially when their drilling and drumming prevents people from sleeping. Not only are woodpeckers a noise nuisance, they can also permanently harm your home or building. They will drill right through stucco and wooden siding and damage your property, and the holes they make provide access for other pests such as mice, bats, rats and squirrels to enter inside. Then the problem is compounded. If starlings decide to occupy a woodpecker hole, they will bring bird mites with them in large numbers. To further complicate matters, trapping woodpeckers is only legal with a federal kill permit which is expensive and takes time and a lot of effort to obtain. Such permits are usually a last resort measure. In order to stop woodpecker damage and prevent woodpeckers from further harming your home, it is important to contact a professional pest bird control operator who knows how to get rid of woodpeckers safely. Our technicians have woodpecker repellents, including visual and taste products which are very effective woodpecker deterrents and are legal. 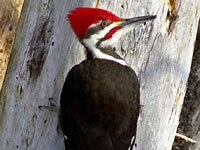 Read more about woodpecker control, and remember to check out our Woodpecker Photos and prices for woodpecker removal. Honeybees, or Bees choose to live in places that are dark and offer shelter from wind and rain. Hollow trees work well, but so do walls. If bees can get inside a wall they will use the wall cavity to build up their honeycomb and fill it with honey. If this continues for very long, the weight of the honey can eventually collapse a sheetrock wall. Or, if it gets hot, the wax will soften and melt and the honey will run down the wall and onto the floor and carpet. Bees also are attracted to the small openings at roofs’ edges and may build up their colonies inside an attic. Honeybees are not particularly aggressive, but the likelihood of being stung increases when they are in close proximity; colonies usually number in the tens of thousands. 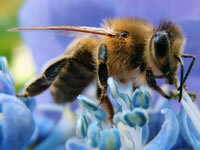 This risk is particularly dangerous for people and pets that are allergic to bee stings. If the bees are Africanized, which is becoming more common in the United States, then they will be very aggressive and bee extermination is necessary. Bee removal is not for the faint-hearted; bee buzzing can be very unnerving and if bees feel threatened they will attack in a coordinated manner. Our professionals can remove bees and perform the necessary maintenance and repairs to prevent another colony from occupying the same space. Read more about honeybee control and remember to check out our Honeybee Photos and prices for honeybee removal. Insects will enter your home on the backs of any pest animal or bird that comes there. If you have an animal or bird infestation, then not only must the larger animal or bird be removed but insect control measures must also be taken. Ticks, mites, fleas and flies are common insects that accompany larger animal problems, but there are many others. If you have a dead animal or bird in your building, the accompanying maggot and insect problem could be quite serious. Our technicians have effective treatments for this purpose; they can remove the bugs, sanitize, and deodorize if necessary. Our products are derived from naturally existing substances and are safe for human contact. Read more about insect removal and remember to check out our Insect Photos and prices for insecticide applications. 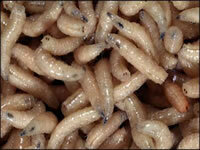 Maggots, or fly larvae appear in extraordinarily large numbers on the bodies of dead animals and birds. When an animal dies, the carcass attracts flies and other insects to come and lay their eggs there. The scent of decay and the presence of insects and maggots can be very troublesome if this occurs inside a home or other buildings. Our experienced professional technicians will remove the body from its location in your home, be it a wall cavity, crawlspace, attic, chimney or elsewhere. Our operators also provide clean-up of the maggots and other insect pests including sanitization and deodorization. Read more about insect control, and remember to check out our Maggot Photos and prices for insecticide applications. 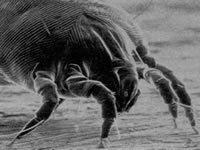 Mites When animals or birds enter your home, they usually bring insect pests with them. Not only must the larger animal be removed, but insect control measures need also be taken. Mites, ticks, fleas, flies and maggots are frequently associated with pest animal problems, but there are many others. Our professional technicians have effective treatments to get rid of mites. Read more about mite control and removal and remember check out our Mite Photos and prices for insecticide applications. Ticks can enter your home on the back of a wild animal or bird. Not only must the larger animal be removed, but insect control measures will need to be taken. 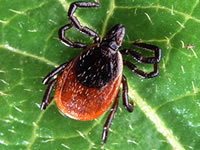 Ticks, mites, fleas, flies and maggots are common pest problems associated with other animals. Dead birds and animals similarly are a haven for insects and maggots. Our professional technicians provide effective treatments to get rid of ticks. Read more about tick control, and remember to check out our Tick Photos and prices for insecticide applications. Snakes found in the United States are usually non-poisonous, but many people can’t tell the difference between a poisonous snake and a harmless one. It can be quite unsettling to discover a snake in your home, crawlspace, woodpile, shed, or under a cement patio or foundation, etc., especially if you don’t know if it is dangerous. Snakes will sometimes enter homes looking for a warm place such as a hearth to curl up next to. They are able to scale walls and frequently get into attics. Our wild animal removal specialists can help you with snake identification and will trap snakes and remove them from your property. 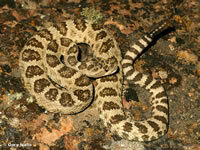 We also offer specialty products such as snake fencing and snake repellents to help get rid of snakes. Read more about snake control, trapping and removal, and remember to check out our Snake Photos and prices for snake removal. Blocking, or Exclusion is placing a barrier in an animal's way. We use a variety of materials to block access points located in soffits, eaves, utility entrance points, foundations, under porches, etc. This is an essential component of complete animal control solutions; without effective blocking and exclusion methods, animal problems will likely recur. Our wildlife control operators not only remove pest animals, they also provide blocking and exclusion services, including temporary repairs and permanent repairs. Read more about blocking, and remember check out our Photos of Blocking and Exclusion and prices for blocking installation. Insecticides, or Pesticides are often needed to treat a building that has been encroached upon by pest animals or birds. Wild animals and birds invariably bring bugs and insects with them such as ticks, mites, fleas, flies and maggots. Specialized treatments are available for insects in all their different stages, ie. maggots versus adults. Our professional technicians can arrange insect control services using products which are derived from naturally existing substances and are safe for human contact. Read more about insecticides and pesticides, and remember to check out our prices for pesticide applications. Poisons are sometimes the best option for pest animal control. They come in many forms (grains, pellets, sprays, etc. ), and each kind of poison is intended for specific animal application. When employing poisons, it is important to be aware of non-target animals that may be affected by their use. Our wildlife control operators can determine whether poisons are the best option for your specific type of animal problem, and know how to utilize this method effectively and safely. Read more about poison treatments as a means of wild animal pest control, and remember to check out our prices for poison applications. Slick fence, or slip fence is a product used to prevent rodents and snakes from getting into an area. The slick material is anchored onto a sturdy support, such as a fence, and rodents and snakes are unable to climb up it. Slick fencing can also be used to prevent animals from climbing telephone poles and utility wires, and may be applied in many other places. We have additional fencing products that extend below ground to prevent animals from digging underneath the fence. Our wildlife control technicians can remove your pest animals and install the slick fencing or rodent fencing for you. This method is highly effective in preventing rodents and snakes. Slick fencing is available in black, white and gray. Read more about slick fence uses, and remember to check out our Photos of Slick Fencing and prices for slick fence installation. Traps are effective for most wild pest animals and birds and are usually the preferred method of wild animal and bird control, where such trapping is legal. There are many types of traps, some which kill the animal and many others that do not. We have kill traps, live traps, cage traps, claw trap, snap-traps, body-restraining traps, chimney traps, netting, and others. Our wildlife control operators can tell you which traps are best for specific animal and bird problems. Read more about trapping wild animals, and remember to check out our Trap Photos and prices for trapping services. Repellents are effective for some animals such as snakes, swallows, woodpeckers, bats, beavers, raccoons, skunks, and moles. Repellents come in a variety of forms including taste deterrents, smell deterrents, texture deterrents and visual deterrents. Some repellents are chemical; others are installed with hardware to your building or problem area. Read more about repellents as a means of pest control, and remember to check out our prices for animal and bird repellents. Vents are one-way "doors" that allow animals to exit a building but not come back in again. Vents are very useful when an animal is in a location we cannot access (at least, not without doing a lot of damage to your building), or when the problem animal is protected by law. With venting, the animal is not harmed in any way. Sometimes our customers request vents because they feel it is more humane than trapping. The downside to this procedure is that since we do not actually trap the animal, we cannot take it away. Sometimes venting opens the door for problems down the road, say, at your neighbor's house. Or, the critter may decide it likes your house so much, it will persistently look for a new way in. Read more about venting pest control, and remember to check out our Venting Photos and prices for animal venting services.